Columbus Municipal School District was a D-Rated district with a 60% drop-out rate and only 30% of students meeting grade level expectations before implementing OER in 2014. "Leading with technology is a negative disruptor. Schools like to start with device deployment but are unsuccessful and wonder why. 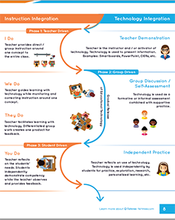 We led with professional development first and then technology." 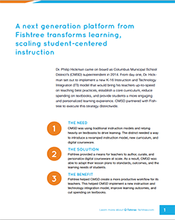 *Learn more about how Fishtree's personalized learning platform can help you implement OER in your school or district. In less than two years, CMSD has dramatically increased graduation rates by 20%, grade level expectations by 40% and they are now a C-Rated district. What's more is that they saved more than 800k in textbooks.